This is one of my favorite cocktails. No party is complete without it. It just isn’t. Let’s face it, wine is for dinner but when we need to get the party started, this will do it. I don’t think there is a more perfect color for a drink. The blue makes it appear intriguing but the drink holds its own on taste. The color also makes it perfect for all the upcoming patriotic holidays (Memorial Day, 4th of July & Labor Day), baby showers celebrating a boy, summer luaus and let’s not forget Hanukkah! If you have never had Hpnotiq before, I will stop here so you can go to the store and pick some up. You’ve been missing out. It’s unique flavors come from a blend of vodka, cognac and fruit juices. It can be served cold on its own but I enjoy it the most when used as a mixer. This particular drink puts you on a tropical island with one sip. I already have my beach chair picked out so let’s quickly mix this up so we can enjoy the rest of the day. Here’s all you need to make this happen: Hpnotiq liqueur, coconut rum (such as Malibu) and pineapple juice. How easy could this be? 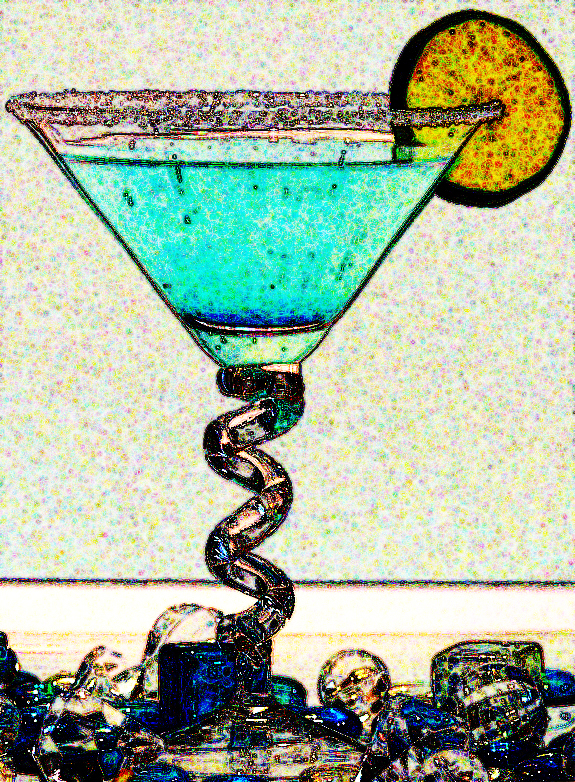 Add 2 ounces of Hpnotiq to a cocktail shaker. Add 1 ounce of coconut rum to the Hpnotiq. A splash of pineapple juice (maybe 1/2 an ounce). A bunch of ice to cool it all down. Now shake it up and pour it through the strainer so the ice remains in the shaker, into your favorite cocktail glass. If you happen to have some rock candy stirrers hanging around, go ahead and add them as garnish. Don’t forget to dip the rim of your glass in sugar, it really makes this drink special. sugar, for the rim of the glass. Dip the rim of a glass into pineapple juice (or water) and then dip in sugar. 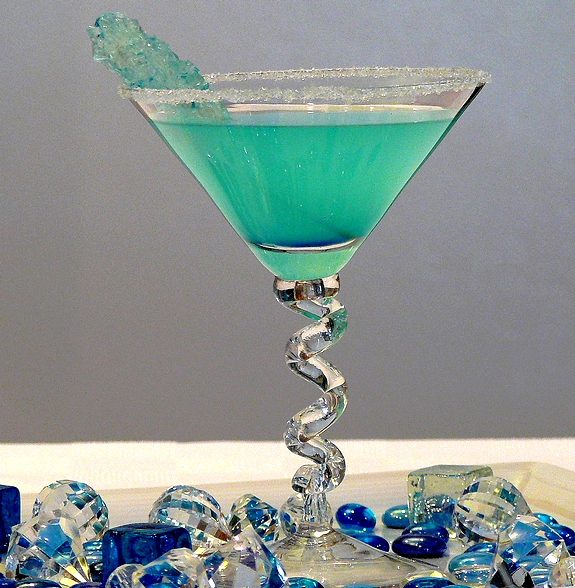 Add Hpnotiq, coconut rum and pineapple juice to a cocktail shaker. Add enough ice to the shaker to cool down the mixture. Put the lid on and shake until well mixed. Pour through the strainer into your favorite glass. Garnish with whatever you like. After you’ve had a few of these, playing with photoshop becomes very interesting. I feel warm and buzzy just looking at that. And just a little bit more glamourous. I’m glad Mental P brought the cocktail napkins we are soooo going to have a fun party. I’ve had many of these over the past few years and can attest to the pleasure and sensuality of the drink. It’s amazing. Expensive, ;), but amazing. I just added Hpnotiq to my grocery list. THAT looks amazing….I have got to go check Krysta out! As ususal, you never fail to capture my complete and total attention with your drink recipes and pictures!! Great recipes and images, as usual! YOU ARE GOOD!!! That last photo is wonderful! Maybe you should make a habit of always having a few of those luscious looking cocktails before you photoshop. your a temptress. Dazzling and pretty, the drink. Anytime your back this way in the south you just look me up all right? Well go find a shaker and a blender and all the ingredients to sing cockroach songs. I’ll sing you all the words to “Skin and Bones.” Course you wouldn’t remember a thing,…what’s your hangover cure? I’ve had two and I’m feeling oh so giggly! I hope someone shows up with more food soon! It looks great but coming from a family with many alcoholics I never drink anything with alcohol in it. we should consume this post with great moderation…for the photos are sooo “hipnotic” stunning photos!!! That is one pretty drink – I love the colour. Great photo too! I love the glass. Even water would look great in that thing. How cool. I might have to drop everything and run to the store to pick that up! It looks delectable! Those are awesome! I just might have to steal them for a friends Bachelorette Party next year! LOVE the photoshopped version of the drink! We have Hpnotiq in the bar at home. (something about it being the closest to the Sharks colors). We’ll have to try this (something about drowning our sorrows). Drool…..however, I want that glass. Mmmm…pretty! And, I have that same glasses set here! Oh this is so pretty and sounds good. I have never had Hpnoti before, but I love coconut rum and pineapple! I will have to look for some Hpnoti to try! The best, blue drink I ever tasted the bartender called a “Tidy Bowl.” While the name was less than elegant (Tidy Bowl? Really? For a fru-fru cocktail?) it was darn good. Never had one before or after. Your photos are making me rethink that–love your glass by the way. And your Photoshop experiment? I want a copy of that! It would look great sent out as cocktail party invitations! O! this brings back memories…it was such a kool thing to have in your hand when it was a fairly new drink. Thanks for stopping by my blog … hope you had fun in Seattle! That is unusual, Cathy! And it looks delicious, too. t looks great but coming from a family with many alcoholics I never drink anything with alcohol in it. This is the best cup I have seen. Nice photos. Thank you very much for sharing with us. Incredible! I haven’t ever taste like it as you have posted the beautiful photo here. Its hard to control the temptation! Thanks for that great thing. 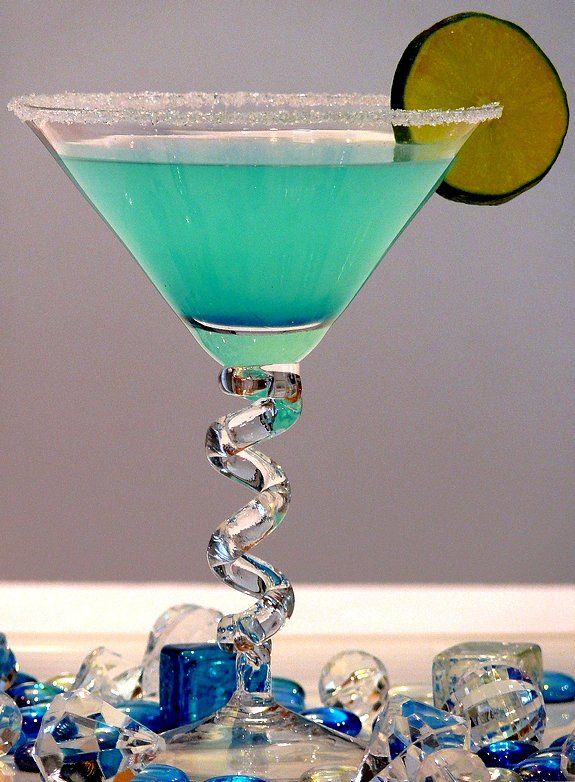 Hpnotiq Breeze is essential for this tip of party.But what is the main cause to prefer this? I think that there are some another drink which is much batter. The photo is perfect…..color is gorgeous. I am loving it……. The photo is great…color is gorgeous.I am loving it. Drink serve photo shopped is fantastic. Wow nice picture which you attached.It inspiring me to drink wine.However,i love Jewish men specifically. Love to drink it. Hope you will be shine in future. I think you need to add some harmful affect of drink wine.Because its bad for our bodies. Thanks for sharing the info.I will check it out.Hopefully it will satisfy my need. Oooh. I could get really drunk on those. I love fruity, brightly colored cocktails. Both photos are beautiful. As a fellow shiksa married to one of the tribe, I wish both you and your husband a very happy Hannukah! Thank you so much for sharing your colorful cocktails with us. it’s also very helpful for me. Any one get knowledge by this blog. last of all i appreciate your photo.Hmmm..it’s a great idea.